We’ve been so busy lately that although we have been doing some cooking, we haven’t found the time to blog about it. What we have been cooking has mostly been quick and easy and not all that interesting which makes things difficult to write about. I’d completely forgotten about this until I found the picture while clearing out the camera and remembered that we ate it almost two weeks ago. Stephen picked up some trout on his way home from work and since the weather was so good, we stuffed it full of herbs and cooked it on the barbecue. I remember it being good but since it was so long ago, I can’t remember much more than that. The picture does remind me that I enjoyed the impromptu barbecue and the al-fresco eating though and it’s these reminders that I enjoy when I look back through old posts so that’s why I’ve written this up. Hopefully soon things will quieten down and we’ll have more time for both cooking and blogging. 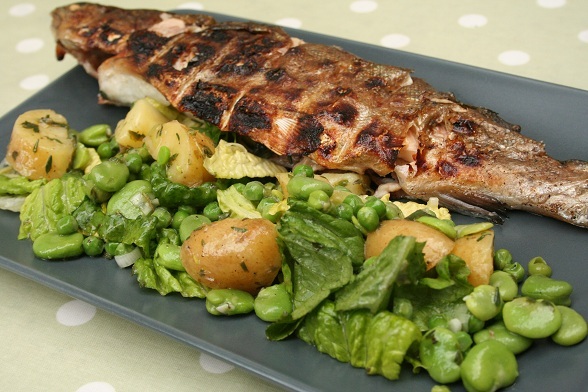 Subscribe to comments with RSS	or TrackBack to 'Barbecued Trout with Broad Beans, Peas and New Potatoes'. That crispy, blistered skin looks really delicious. .-= Lizzie´s last blog ..Som Tam =-. Thanks, Lizzie. I can’t remember too much about it now but crispy fish skin is always good.